Maintaining a seasonal blog presents unique challenges. Forget the old SEO chessnuts of tagging, key words, descriptive titles, links to and from other blogs and so on; it's much harder not to let a blog die a death if you're not putting out fresh content on a regular basis. How do you achieve this when you're making one costume a year, and your blog is based on the costumes you make? Something I'm still trying to figure out. But for now, at least, we're approaching silly season again with Halloween very much on the horizon. Not for normal peoples' standards perhaps, but for me, I feel like I'm late in starting my costume. But more on that later. For now, there is one more past costume to add to the index. The greatest movie villain of all time, bar none. Perfectly portrayed by Robert Patrick: Terminator 2: Judgement Day's T-1000. Perhaps mercifully I cannot get into the level of detail that I did for the Predator and Alien written accounts. Halloween 2009 was successful in its own right, but outside (boring) commitments meant that there was no time to get caught up in Halloween fever in the now traditional months from July and August onwards. This costume was conceptualised and commenced in late September; scandalously late for my standards. Accordingly it was somewhat of a rushed affair, regrettably with very little photographic evidence. 1: A standard kid's size plastic Halloween mask. 2: Dark navy shirt and pants combination. 4: Plastic toy police badge. 5: Four or five strips of lead. 6. Two large cardboard boxes. 7. Two or three very small carboard boxes. 8. Plain black dress shoes. The first item on my ingredients list is a plain, plastic Halloween mask. I had struggled to think of ways to make a mould for my face that would convey the gunshot wound that the T-1000 received at the hands of Sarah Connor in the film (you know the scene - the bullet hole closes itself after a few seconds and he resumes that terrifying calm exterior like nothing happened). However, this turned out to be far from ideal and my one regret about this costume is that I couldn't have found a better way of executing the idea. I would love to have experimented with clay moulds to make something far more professional looking, but I simply did not have the time. You can see in the image at the bottom of the article (from the annoyingly obtuse string) that I was effectively wearing the Halloween mask on the side of my head. The idea was that the edge of the mask would cover my right eye, as this is where the bullet wound is supposed to be. I covered the mask in a layer of papier mache (the old reliable) so I would have a more sturdy base on which to craft the bullet hole itself. For this I made a cylindrical tube out of wire, which I placed horizontally across the face of the mask. The idea was to make it look like a circular chunk was taken out of the character's head. I covered the masking tape in wire, preparing it for the next layer of papier mache. Small triangular pieces of cardboard were cut out and stuck along the edge of the hole in order to make it look more like a messy entry wound. 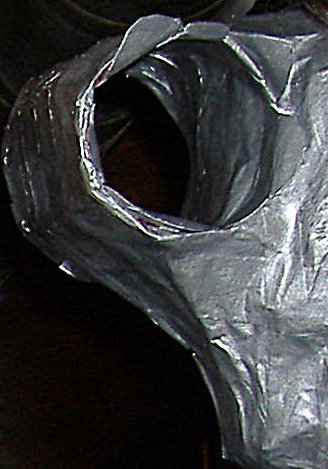 The final layer of papier mache was added to blend everything together, and the mould was painted silver. The core of the costume is the simplest aspect: the uniform. For me it took a little longer than I thought it would, because I could not find the right colour shirt and pants combination. Once I did, I knew that the rest of the costume was in my control and I was a happier man for it. A plain white t-shirt is a small but important detail, as it is quite a visible component of the T-1000 outfit in the film. The plastic police badge was stitched onto the left breast pocket. But the central aspect to the body was undoubtedly the bullet holes. Who can forget the legendary scene from the film where Schwarzeneggor's T-800 confronts Patrick's T-1000 for the first time in the shopping mall? 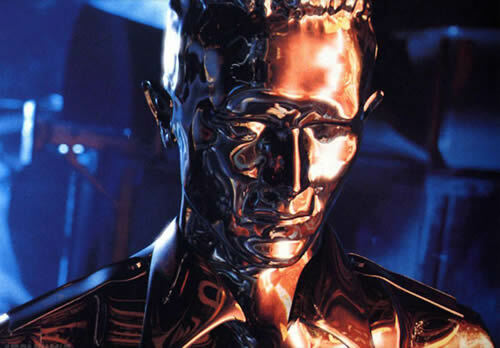 Arnie pumps several shots into the torso of the T-1000 and we see for the first time the liquid metal reforming. To recreate these iconic bullet holes, I opted to use real metal. This was done by melting strips of lead over a bunsen burner. When the metal turned to liquid, it was poured into a steel ladle to give it that rounded shape as it hardened. The next challenge, having made five lead-based bullet holes, was attaching them to the uniform. Using a small drill bit, four holes were drilled into the centre of each bullet hole so they could be stitched onto the uniform using fishing wire. While a good idea in theory, the lead was a little too heavy for the fabric and did not rest naturally on the uniform. This was discovered close to Halloween night, so I somewhat haphazardly (but ultimately very effectively) applied double-sided tape to each 'hole', sticking it tighter to the fabric and stopping it from sagging. One minor addition to the midsection area was a utility belt. The police officer form taken by the T-1000 means that it has various bits and pieces on its belt. I opted not to get bogged down in detail in replicating this; I simply took a few small cardboard boxes (fudge boxes, only a couple of inches in width and depth), painted them black and cut a hole in the sides so I could slip my belt through them. Somebody creating this costume for themselves might opt for greater detail, such as a walkie talkie. What, I ask, would Halloween be if I did not handicap myself in some way through my choice of costume? In 2009, accordingly, I sacrificed the use of my arms - who needs them? It was quite a challenge to make four identical shapes, because the cardboard I used was quite thick and hard to work with. It is, obviously, important to do so as they must match up to make one seemless 3D version. The final part in the arm's construction was comparatively simple: making the actual hook itself. There are tonnes of reference images that can be found with a quick Google search. Simply cut a flat piece of cardboard (around 3-4 inches in length) and attach it to the tip of the arm. Since the tip of the arm is hollow it is hard to glue the hook on; so I used masking tape to hold it in place until I could reinforce it with papier mache, which I applied to the whole arm. This ensured that the joints between each tapered rectangle were secure (my cutting was far from precise, making life a little difficult for myself). Then it was just a case of painting the arms metallic silver. That is pretty much the entire construction. Not as much actual material went into the costume as it did to the two years previous, but it was equally as tough as both. I was pretty content with the costume in the end; as I alluded to earlier, I probably would have done the face mould differently if I was to do it over and had more time. Other than that, I'd call it an overall success.